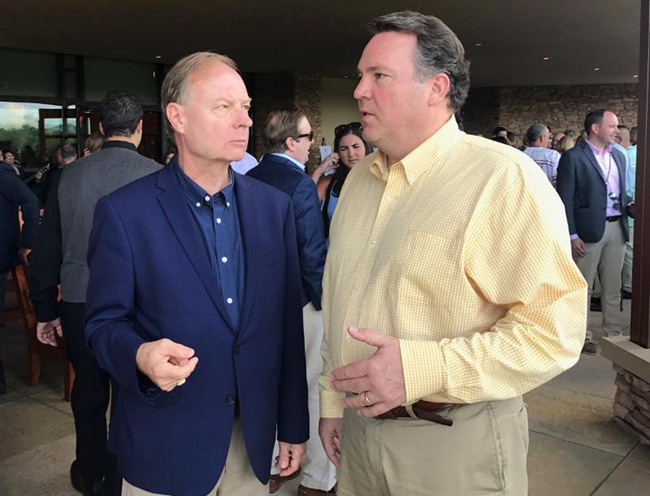 TCA President G. Lincoln McCurdy informing Congressman Alex Mooney (R-WV/2nd) about the 1st anniversary of the attempted coup at the Congressional Republican summer meeting in Pennsylvania. TCA commemorates the first anniversary of the July 15, 2016 failed coup. Tragically, 250 individuals lost their lives and more than 2,000 were injured, many of them civilians who took to the streets to defend Turkey’s democracy. Over the past year, TCA has visited Capitol Hill and met with members of Congress to explain the significance and trauma of the events that took place on July 15, 2016. TCA commends the citizens of Turkey for defending democracy against the illegal coup attempt that took place one year ago. TCA Chairman Dr. Yalcin Ayasli and the entire TCA team send their deepest condolences to those who lost their lives during that tragic night and to their families. TCA President G. Lincoln McCurdy is currently attending a Congressional Republican summer meeting in Pennsylvania this weekend and will be attending a Congressional Black Caucus event next week to explain the significance of this traumatic event in Turkey. Further, TCA has been briefing both Democratic and Republican members of Congress about the failed coup.